Summary: A decade in the future, humanity thrives in the absence of sickness and disease. Review: Look at the cover!!!! Again, some books just hit my hot spots and this definitely did. 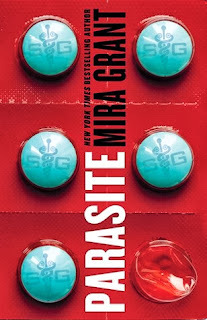 The cover is what first grabbed my attention on Netgalley, but when I saw the author... Mira Grant is one of my absolute favourites for her ability to combine real science with science fiction and that hint of horror and dystopia - her Newsflesh series was and still is one of my absolute favourites. Set in a world where everyone has accepted parasites to keep them healthy and well, the story follows Sal, a young woman who is a survivor of a horrific car crash. A poster child for the movement thanks to the fact that she was saved by the parasite in her head, Sal is reluctantly dependant on Symbogen for her ongoing therapy and still trying to reconcile who she was before the crash with who she is now. Then a new kink gets added into the mix... People are changing, turning into shells of themselves, and Sal is right in the middle of it, dealing with the afflicted, Symbogen and even her own family in an effort to uncover the truth. I'll be honest here, I love this sort of book. I love when science and horror get mixed together, and Mira Grant does it incredibly well. This isn't a book that just tells you what has happened, it's a book that shows you with incredible detail, with Grant's trademark interludes that are taken from interviews with the characters, or personal writings. Taken together, it builds a world that has an incredible amount of thought and detail put into it, both fascinating and horrifying. Not necessarily a book for the squeamish, Parasite is a book that touches on the common human fears of bioengineering and medicine gone wrong and explores them with compelling thoroughness. I am definitely intrigued and eager to see the next book in the series! Disclosure: Arc obtained through Netgalley.